London, Paris, Tokyo. Across the globe people lined up around street corners. Some camped out. Some cheered. Hungrily, they waited for the moment – it wasn’t for tickets to some rare concert ,not for a hugely anticipated movie premier – the moment they sought was a chance to grab a bit of tech history, Apple’s latest trophy device, the iPad. Originally intended for an earlier global roll out, Apple had pushed back the delivery date to insure there was ample inventory to supply the domestic market. The extended wait seemed to only fuel greater anticipation and more gadget lust. 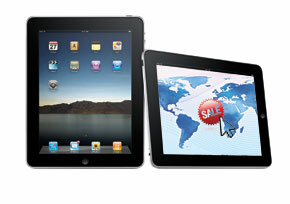 In the U.S., a million iPads were sold in the first 28 days. International buyers were anxious to get their chance. Some pre-ordered the device as early as May 10th. Others wanted to be sure stores didn’t sell out before one was in there hands. Country to country, street corner to street corner, the moment arrived, Apple stores were jammed with people curious and intrigued. If the momentum is sustainable, sales tallies are likely to be outstanding. Regulators Taking a Look at Apple's Practices?